Canadian military formations run the gamut from infantry-based forces to fully equipped armoured regiments. The arsenals at Toronto are capable of turning out full-sized Land Ships to standard Britannian patterns, and the shipyards are capable of servicing vessels of all sizes. The intimidating Resolution Class Land Ship is the powerhouse of the Dominion of Canada’s impressive military force. ... <lire la suite>. Canadian military formations run the gamut from infantry-based forces to fully equipped armoured regiments. The arsenals at Toronto are capable of turning out full-sized Land Ships to standard Britannian patterns, and the shipyards are capable of servicing vessels of all sizes. 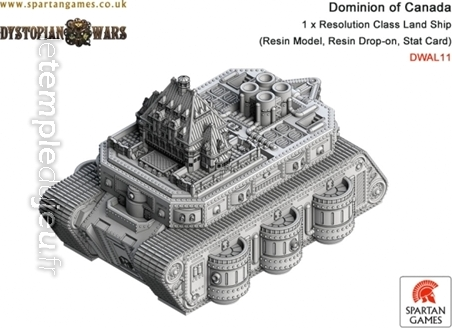 The intimidating Resolution Class Land Ship is the powerhouse of the Dominion of Canada’s impressive military force.